Fortunately, I have not had any problems with the city or neighbors and several neighbors have even commented on how much they like my garden. Nobody else has removed their lawns, but maybe that will come in time. Gardening is often a solitary endeavor and this blog has given me the opportunity to share my garden with people from across the country and across the world that can appreciate my gardening endeavors, but would never see them otherwise. Many of the people that visited the blog left comments and links to their own blogs which gave me the opportunity to get to know them and their gardens. A few of those cyber visitors (Pam and Shirley) even visited the garden in person and it was a pleasure to meet both of them. 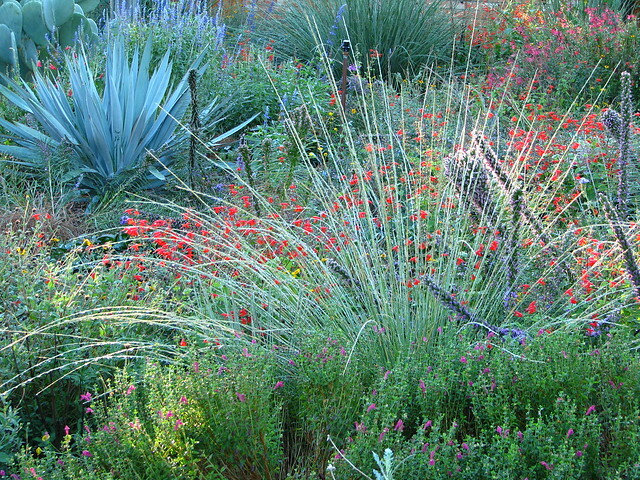 I have enjoyed sharing my Texas native plants with the world. It is funny how many people in Europe have a greater appreciation for North American native plants than we North Americans. Maybe we think that a flower we see growing in a field or vacant lot is a weed and too common to be cultivated in a landscape. But if you really want to see common, just take a look at your typical suburban landscape. From sea to shining sea, most of them look exactly alike: a lawn of imported grass, a couple of trees, a row of shrubs against the foundation of the house and maybe a flower here and there. Not only are most of these landscapes boring, but they do nothing for the wildlife that is trying to survive among us. I know the larger wildlife like bobcats, wolfs, coyotes, raccoons, possums, and armadillos that used to make this place their home are unacceptable to most people in suburbia, but we can plan landscapes that will help out the birds and butterflies and maybe even the bees and lizards. That is where native plants come in because they produce or attract the food that the wildlife has evolved with for ages. I hope that this blog has helped a few people gain an appreciation for native plants that they may not have had before. It is possible to make an attractive landscape with native plants and you don’t need to go the extremes that I did. You can fit natives into the typical suburban landscape I described above. Anyway, after all of that rambling, the purpose of this post is to tell you that I have decided to take a break from the blog and I don’t know if it will be for a while or forever. Even though I only post a couple of times a month, I spend more time than you would believe putting a post together. And, personally, I think the posts are getting redundant and boring. I don’t want to be like the guy that shows boring home movies to his sleeping audience. I do have a couple of ideas for new themes I could post about in the future, so check back. You never know. I plan to add to the blog a list of the plants in my garden and links to other blogs that I enjoy. Things I have planned to do for a long time, but never did. One more thing. The blog spam is getting out of control so, in a few weeks, I will turn off the ability to leave comments on the blog. If anyone should want to get in touch with me, I will give you my email address in the form of a puzzle (to avoid more spam). My email address is my last name followed by my first name (with no characters in between)@yahoo.com. 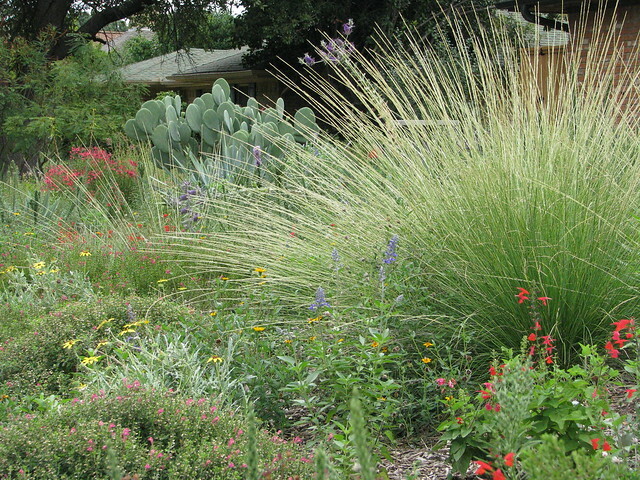 You can find my name in the 2010 Dallas Morning News story about my garden. Follow the link here. And now a parting video that you may have come across before. I first saw this video clip about a year ago and I never got around to posting a link. I have watched the clip at least a dozen times and I am amazed every time. Watch it in full screen. This is why we need to grow more native plants. So long for now. I will keep in touch through your blogs. Here is a photographic journey through the seasons of 2012 in my front garden. Toward the end of the post are hints of changes that will be occurring in the new year. The year started out with concerns that portions of my garden could be destroyed as the city replaced sewer connections throughout the neighborhood. Fortunately, the contractor was attentive to my concerns and only one plant did not survive being transplanted. January 24. A worker is in a hole surrounded by four nerve daisies. The 2011-2012 winter was so warm that the four nerve daisies bloomed non-stop. February 19. Pine muhly right before I trimmed all of the plants back to prepare for a new season's growth. March 13. Four nerve daisies filled the garden. March 24. Dew on the blades of Indian grass. March 31. Temporarily coming out of a drought with a wet and early spring caused the flowers to explode with blooms. The four nerve daisy plants are huge! 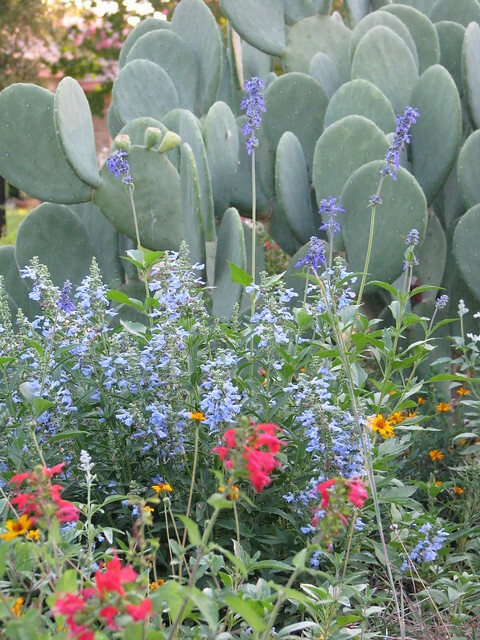 Bluebonnets, wine cup and mealycup sage are beginning to bloom. March 31. This was certainly the best spring my garden had seen. Even neighbors that were not impressed with my lawnless garden were starting to change their minds and said the garden was beautiful. 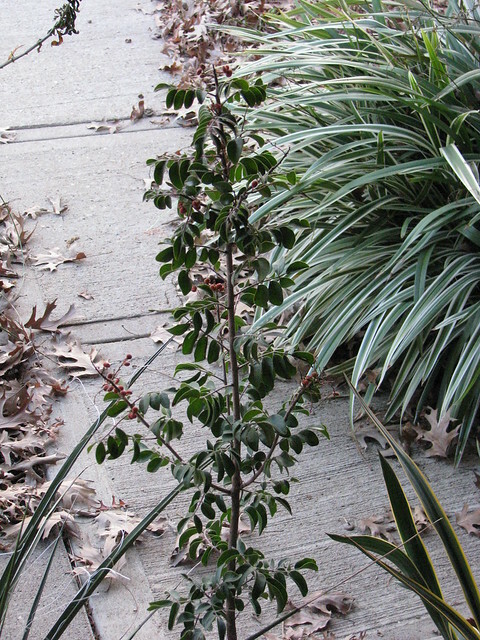 The dark leafed plant is Husker Red penstemon. March 31. 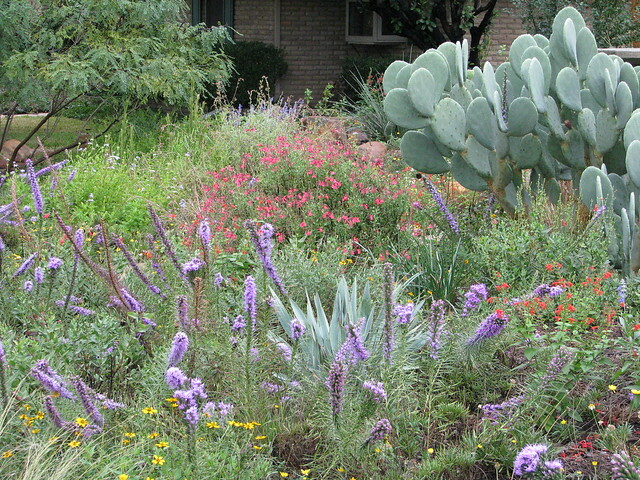 Gulf coast penstemon, bluebonnets, four nerve daisies, and Gregg's salvia are in full bloom. April 7. Sunrise over the wildflowers. April 7. The Hercules Club tree is in bloom and very popular with butterflies and bees. April 22. Black Sampson coneflower blooms. May 2. The four nerve daisies are taking a break after a long bloom period. Several of the plants began to die. After blooming all winter and spring, I think they bloomed their hearts out and could not go on any longer. 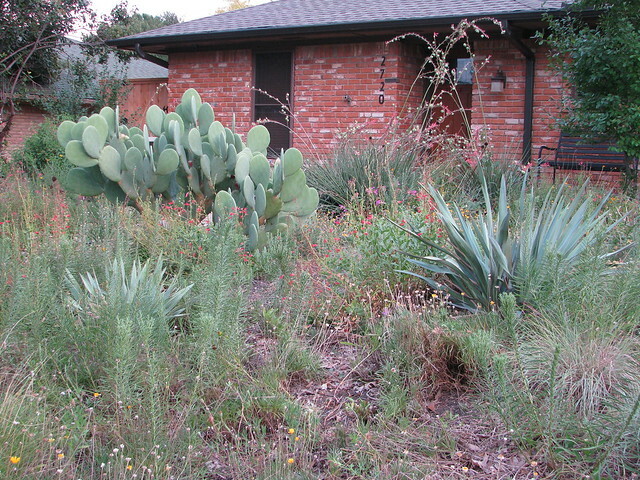 The red yucca and mealycup sage are in bloom and the spineless prickly pear is adding a new layer of pads. May 20. Rock penstemon is in bloom next to pale leaf yucca. May 20. Annual wildflowers, horsemint and Indian blanket, sprouted everywhere. June 17. The spring flowering season is about wrapped up. July 9. The garden goes dormant to survive the hot, dry summer. Flowers are few. This is the most unattractive season for my garden. It was also about this time that I decided to stop referring to my garden as a prairie, although I did not change the blog name. A prairie is primarily composed of prairie grasses and mine were fizzling out. A couple of years ago this area was filled with little bluestem and now only a few remain. With all the dry years we have had lately, I am looking westward for plants that will look good during the dry seasons and still survive the rare wet seasons. July 14. 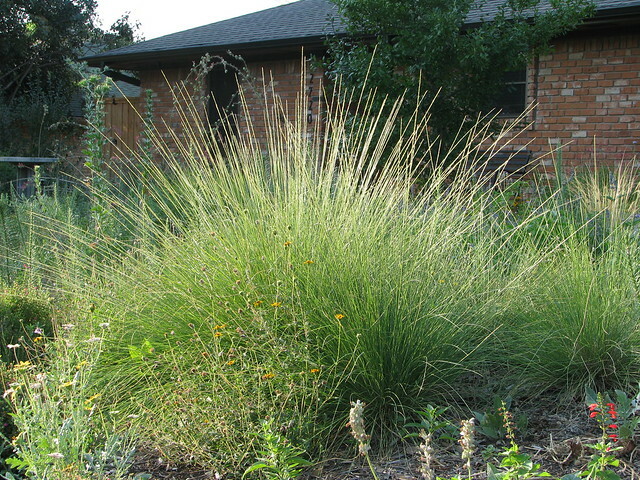 One successful grass is the west Texas native, pine muhly. 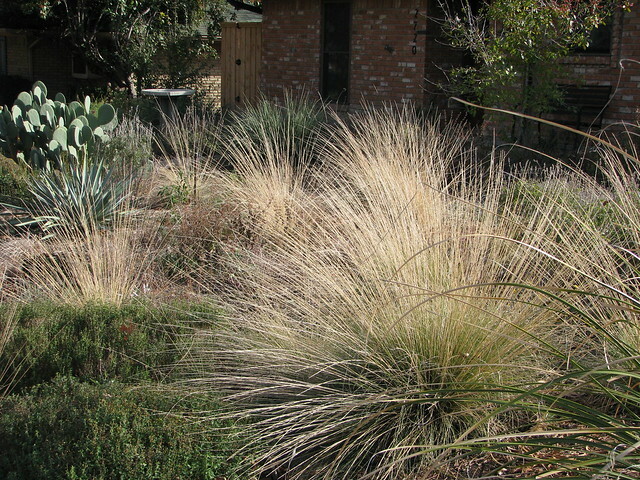 This clump of plants is in bloom (the spikes) and is not fazed by heat and drought. It also reseeds, but not aggressively. 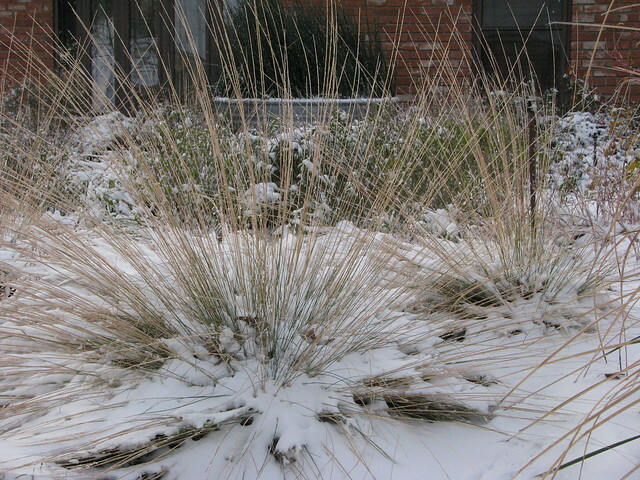 My little bluestem has never reseeded so there are no new plants to replace the old plants. August 26. The garden is pretty lush for late August thanks to rain 10 days earlier. It is amazing how quickly the native plants will rebound once they get some rain. Treated city water does not have the same effect. September 12. The autumn flowers are blooming. 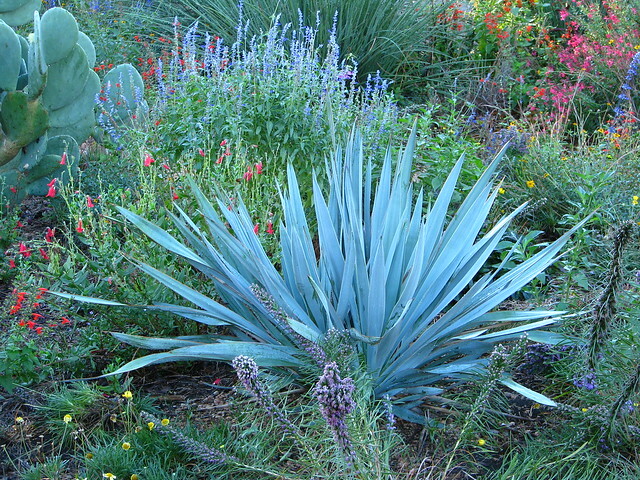 The sky blue flowers in the center are pitcher sage. 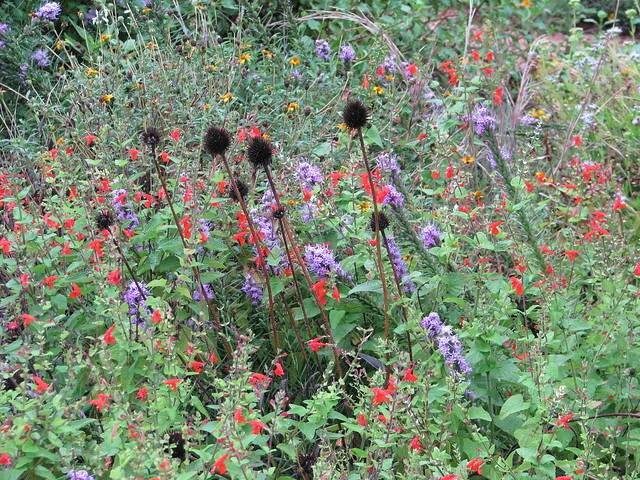 It is surrounded by mealycup sage, zexmenia, and scarlet sage. September 30. Spikes of gayfeather bloom across the garden. September 30. Gayfeather among scarlet sage, zexmenia, and the dried flowerheads of Black Sampson coneflower. October 7. 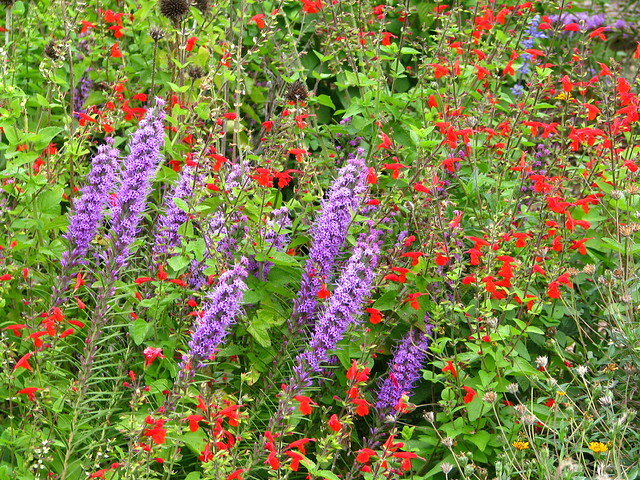 Gayfeather and scarlet sage make a nice combination. October 14. Which is most attractive? 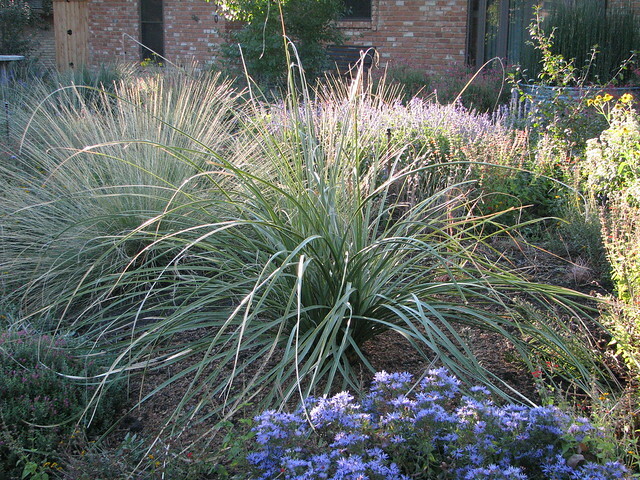 The the powdery blue pale leaf yucca or the flower spikes of pine muhly? October 14. On this day, I think the pale leaf yucca wins. It rained overnight and really seemed to enhance the blue coloring. October 29. In an effort to add some structure and evergreen color to the front garden, I relocated a Nolina that had outgrown its spot in the back garden. This was the second time I moved the plant around the front garden in a 10 day period. I am not sure it works here, so it may have to go. October 29. 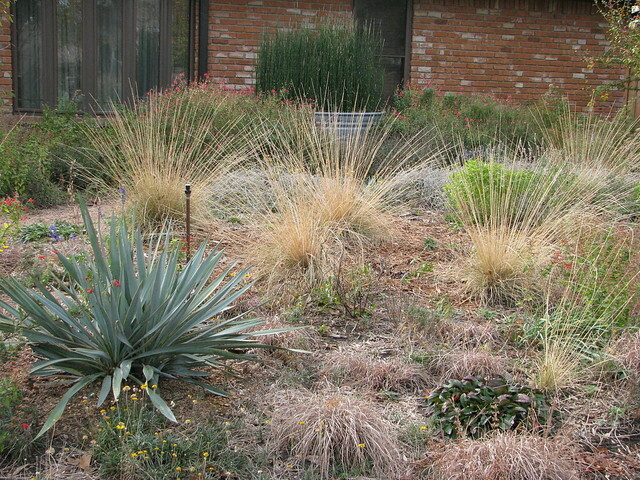 Looking to the left of the Nolina, I removed the pine muhly seedlings that were growing under this plant and spread them across the front garden. I can't say anything bad about pine muhly. It could be my new favorite plant. November 22. And it is no wonder why I like this grass. Here are some of the relocated pine muhly. They are lit up by the late afternoon sunshine. Now notice the pathetic little bluestem in the lower right corner. December 9. This is about the same shot as the November 22 photo. Still no killing frost, but most of the flowers are about finished blooming for the season. December 9. 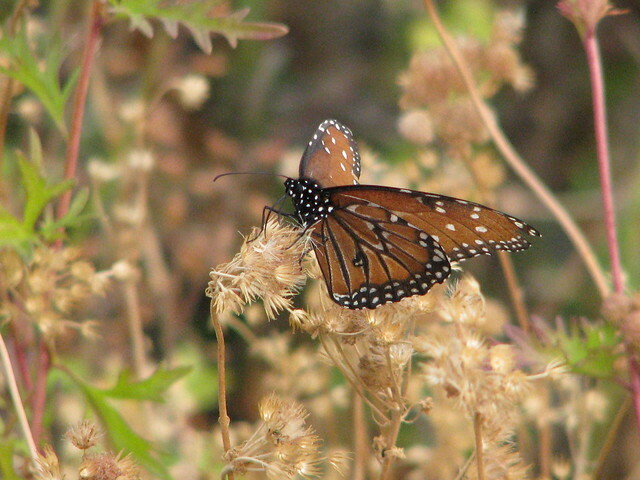 There were several queen butterflies desperately seeking nectar on the dried flowers of Gregg's mistflower. December 15. A view of pine muhly across the front garden. December 26. Christmas snow on the pine muhly. I am sure this grass will be a dominant feature in the next phase of the garden. Thanks to some end of season plant sales, I picked up several new plants at half price. I was blinded by the sale prices and now I am not really sure where these plants will go. At 11:00 in this photo is Yucca filamentosa. 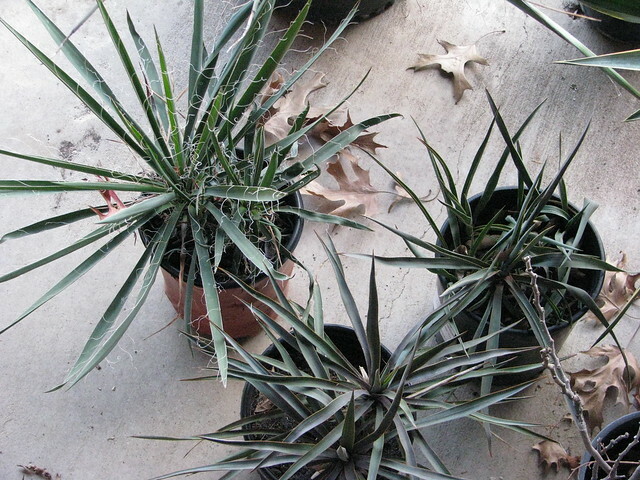 At 3:00 another plant that was labeled Yucca filamentosa and at 6:00 is a plant labeled Yucca pendula. 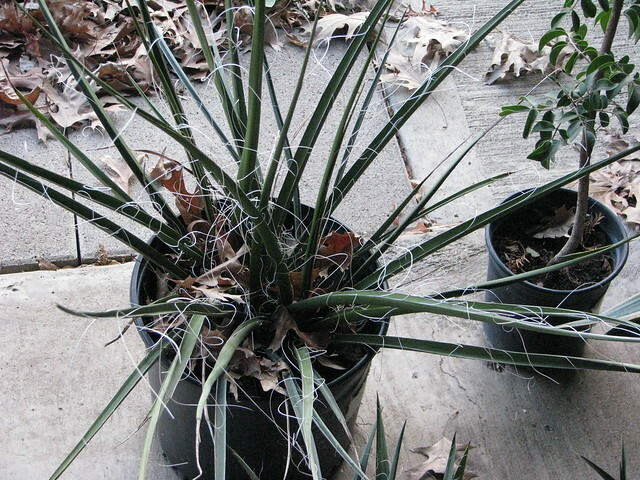 I am sure the first yucca is as it was labeled because of the filaments on the leaves. I am not sure about the identity of the next two. They look alike to me. Both have a purplish cast and neither has filaments on the leaves. I hope both are not Yucca pendula. Once I looked up Yucca pendula, I realized it is the yucca that is very common in landscapes. 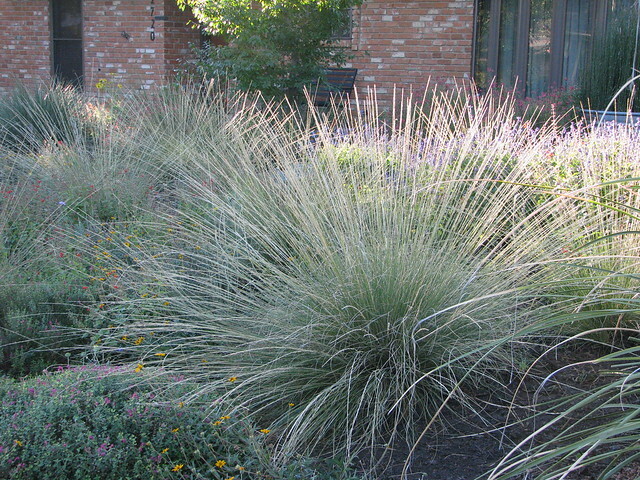 I want less common plants in my landscape. Oh, over in the lower right corner is flame sumac, Rhus lanceolata. This plant was labeled as "Giant". The nursery workers told me it was a giant red yucca. I knew it was a Hesperaloe but not Hesperaloe parviflora. I am pretty sure it is Hesperaloe funifera. I first noticed Hesperaloe funifera several years ago when they were grown in the raised medians between the north and south bound lanes of Central Expressway in Dallas. 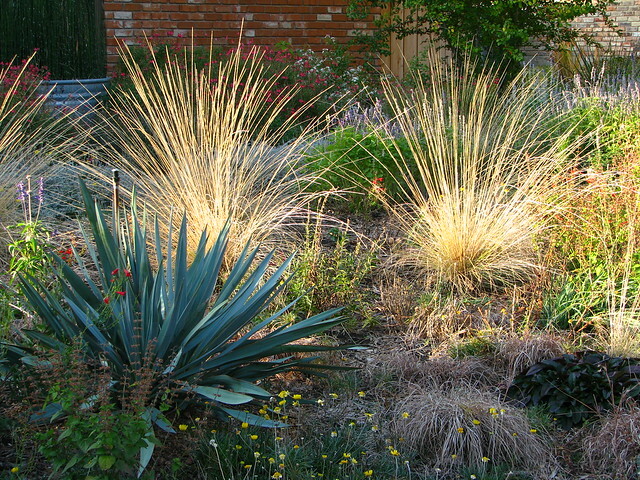 I hope it is as tolerant of clay soils as the red yucca. 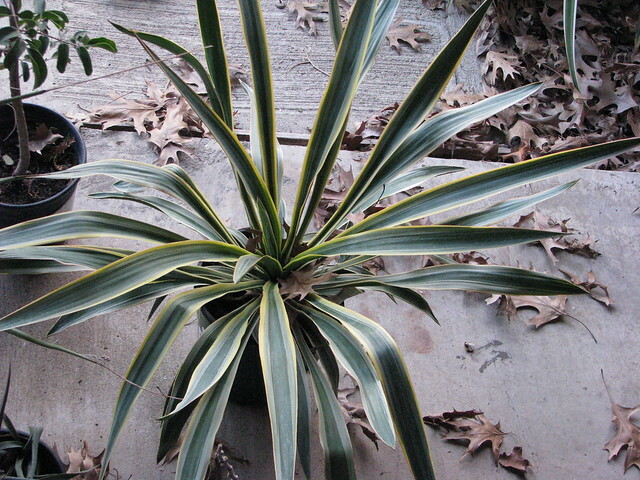 This is a variegated Yucca gloriosa. I am not a huge fan of variegated plants, but I may be able to use this one. I said I am not a fan of variegated so pay no attention to the Dianella in the background. The focus of this photo is the evergreen sumac, Rhus virens. Books from 10-15 years ago said it is a little winter tender in this area. Maybe not any longer. So that is a look at 2012. It is fun to look back and see how the garden changes throughout the year. I am sure it will change some more in the new year as I move, remove, and add new plants.